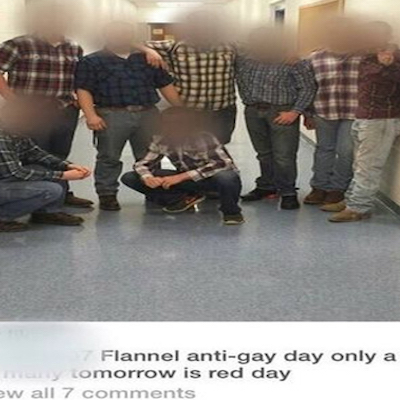 By Josh Middleton·	 4/20/2015, 10:38 a.m.
McGuffey High School in Claysville, Pennsylvania made headlines over the weekend when a group of students organized an “Anti-Gay Day’ in direct retaliation to the LGBT youth-supportive National Day of Silence (NDOS) on Friday. According to WPXI, some teachers tried their best to protect the students by running out and taking down the posters before anyone saw them. The Superintendent, Dr. Erica Kolat, has also issued this statement. [On] April 16, 2015, allegations of harassment were brought to the attention of our administration. McGuffey School District, along with school police officers, continue to investigate all allegations. We will follow our Student Code of Conduct, and file legal citations, as warranted. We resolve to ensure that all children can grow and learn in a safe, supportive environment free from discrimination. I reached out to Superintendent Kolat’s office, but have yet to get a response. Stay tuned for details about what officials are doing to clean up this mess.